Carillon Lake *No Longer Available | Northern Wilderness Outfitters Ltd.
**Unfortunately, Carillon Lake burnt down the summer of 2011." Carillon Lake is located about 100 miles north of Lac Seul. We just completely remodeled the cabin and are happy to have another beautiful and well-equipped cabin in the Canadian wilderness. This is our largest cabin with 3 large bedrooms and can accommodate parties of at least 10 fishermen comfortably. 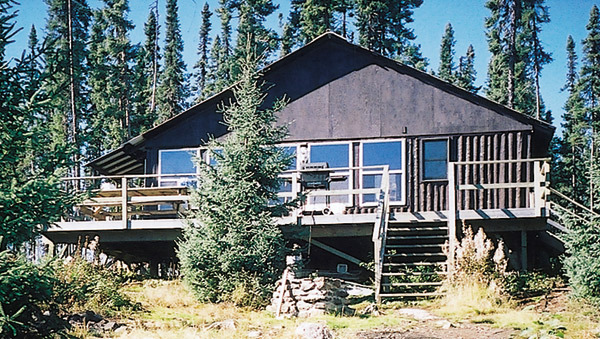 Hot showers, running water, propane lights, large refrigerator/freezer, gas barbecue grill, gas fish cooker, large mattresses, comfortable lounge furniture, large kitchen table that can accommodate at least 10 fishermen for eating and playing poker, large 14’ boats with padded swivel boat seats, and other amenities to make your stay in the wilderness a time to remember. There is plenty of room to fish for everyone who will have the opportunity to drop a fishing line in this lake. For those large groups of 10-12 fishermen Carillon is the lake to have a great time on!